It wasn't the prettiest game, but a late goal by Duncan Keith and shootout tallies by Patrick Kane and Jonathan Toews helped the Chicago Blackhawks to a 3-2 victory over the New Jersey Devils on Tuesday night. The win spoiled New Jersey goaltender Kevin Kinkaid's NHL debut, as his 37 saves weren't enough to secure the victory. 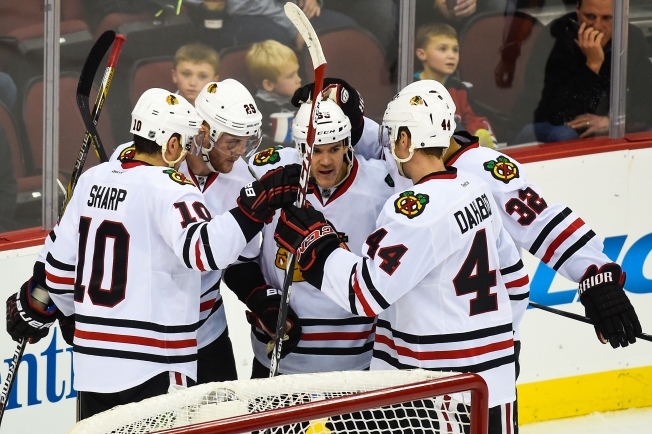 Scott Darling stopped 22 shots and both shootout attempts as he won his second game in a row for the Blackhawks. The game got started out slowly for both sides, with the Blackhawks seeming to struggle to find their footing against an aggressive Devils’ forecheck. Neither side really controlled the tempo however, and early chances by Steve Bernier and Jonathan Toews were both kept out of the net as the game remained scoreless. In the middle stages of the period, the Devils started turning the tide a bit thanks to some Blackhawks mistakes, but Darling made a couple of key saves. His big one came on Jordin Tootoo as he kicked across the crease to make the save, and a follow-up by Martin Havlat went just wide of the cage. Tootoo did end up getting his revenge with about five minutes remaining in the period as he took advantage of a turnover to give the Devils the lead. Andrew Shaw turned the puck over at center ice, and Tootoo drove into the zone and ripped a wrist shot past Darling and just inside the far post to make it a 1-0 lead. The Blackhawks continued their struggles as the first period ended and the second period began, with chances coming few and far between. A Patrick Sharp scoring chance seemed to energize the team even though he barely missed on a deflection-attempt, and Kane followed it up by nearly scoring on a semi-breakaway down the ice. Kinkaid was able to stay centered on the shot, and he made a big save to keep his team ahead. A little bit later in the period, a great defensive play by Sharp got the Blackhawks back into the game. Knocking down a pass in the neutral zone, the forward chipped the puck back up ice, and Bryan Bickell picked it up. Skating across the blue line, Bickell didn’t have an open passing lane, so he fired a wrist shot in on net and beat Kinkaid to tie things up at 1-1. The Blackhawks had a great opportunity to put the Devils behind when Daniel Carcillo drew a four-minute penalty, but their power play unit wasn’t able to generate much pressure. Brent Seabrook did have a good shot in from the point late in the man-advantage situation, and Kane nearly scored from the doorstep as it expired, but neither shot went in and kept the game tied. The period ended with the Hawks generating a few more scoring chances, but to no avail. Brad Richards and Ben Smith both had good opportunities in the closing moments, but Kinkaid made back-to-back saves as the game hit the second intermission. As the third period got underway, the Blackhawks’ momentum from the second seemingly vanished, and the Devils quickly took advantage. Just two minutes in, a shot from the point was deflected up into the air, and Stephen Gionta was able to locate it and bat it out of midair and into the back of the net to put the Devils up by a 2-1 margin. The Hawks’ offense continued to struggle through the middle stages of the frame, and the Devils nearly scored again about halfway through. Martin Havlat drove in toward the net after making a nice play to get free in the neutral zone, but his shot deflected off of the far post and the crossbar before bouncing away from the net. That missed opportunity came back to bite the Devils a few minutes later as the Hawks tied the game with about three minutes remaining. Marian Hossa made a nice play to drive through traffic, and his shot on net was stopped by Kinkaid. The rookie goaltender yielded a huge rebound however, and Duncan Keith pinched in and fired a one-timer into the empty cage to tie things up at 2-2. The game ended up going to overtime, but despite a late power play in the extra session, the Hawks couldn’t finish the game off. Hossa had a tremendous one-timer that Kinkaid was able to stop, and Seabrook whistled a slap shot just wide of the cage as the game headed to a shootout. In the skills’ competition, Darling got things started with a nice save on a Havlat wrist shot. Toews rewarded his goaltender by scoring on his first attempt, making a nice deke and eventually sliding a shot through the blue paint and into the net to give the Hawks an early edge. Jaromir Jagr was stopped on his shot attempt for the Devils as Darling closed his leg pads, and Kane finished things off on the Hawks’ second attempt as he wristed a shot inside the left post to seal the Blackhawks’ seventh straight victory. The Hawks will be in for a big test on Thursday night as they take on the Boston Bruins in Beantown.